3.3 Everyone with frequent tension knots needs one! Body back buddy reviews 2019! After a decade it is not odd to tell that the back buddy is not predictable by its looks. This body back buddy is a deep tissue massage device and has made a history of its own. You can effectively relieve back pain by using the back buddy. This massager contains 11 knobs. Those knobs will give you the massaging ability to have the best as you choose for your pain relief. And the accessibility to any stress part of your body will relieve muscle knots and spasms. The intensity levels and simple design of body back buddy go users with myofascial pain syndrome. The lightweight will impress the users of the massager featuring low price. Exception: Users who complain about flexibility issue & need to massage in the specific area then Homedics Back and Shoulder Percussion Massager can be a healthier alternative. USA Made – Since 1995 every Body Back Buddy has been 100% sourced. This deep tissue massager is made from USA. Used Material – Each and every body back buddy massager is made from high quality and high-density polyethylene with numbered batch lots. This polyethylene is a BPA, PBDE, TBBPA free material which is subject to US Health and Safety Standards. It offers you an earth conscious and hypoallergenic product that you can safely use in the shower. RELIVES PAIN AND SPASMS -You can effortlessly place the body back buddy in your pain areas and easily relieve muscle knots, spasms, and trigger points. For better self-treatment, you can use the 12-page instructional manual. HIGHLY RECOMMENDED BY EXPERTS – The Body Back Buddy highly recommended by medical professionals, massage therapists, and physical therapists. It is the ideal tool for the complete self-massaging experience. 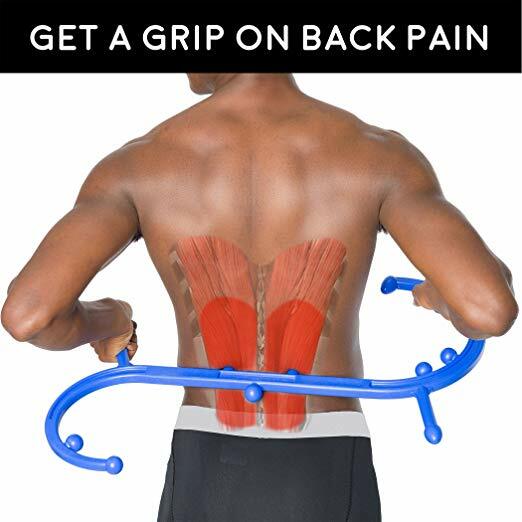 There is no other massager better suited for Myofascial Release (MRF), Trigger Point Therapy, and Deep Tissue Massage Therapy than the Body Back Buddy. BODY BACK BUDDY GUARANTEE – Since 1995 the Body Back Buddy has been proudly tested, designed, and manufactured in Portland Oregon. The company offers a no hassle, no risk, 100% lifetime guarantee. No hidden qualifications, no fine print, no weasel words. BEST PART THAT I LIKE THE MOST – If you are not satisfied totally with your purchase of this massager, simply return the item within 30 days and have your money refunded. Body back buddy allows you to massage all the muscles of the body like shoulder, neck, back, arms, chest, hands, hips, buttocks, feet and legs through its natural shape and open design. You can easily release spastic and tight muscles. You can easily control the amount of pressure needed. You can also reach the exact spot that needs treatment. Even with minimal effort and strength, you can simply treat areas that are not possible without Body back buddy. There are three ways of therapy knobs on each body back buddy massager. A dull rounded one planned for broader surface massage; a pointed style, which will let you accurately go through deeper into a specific area. And the two (4 & 6) dull nubs placed in the middle of the tool that is designed to massage the upper part of the buttocks and the back on each side of the spine. It is an awesome massage tool. The best part of body back buddy I like is that It comes with a free booklet with the color photos showing a different way to place the Trigger Point. It is one of my best purchases ever! It relieves so much muscular discomfort and pain that It’s an inexpensive alternative to having a massage. I would strongly recommend buying this body back buddy as a gift or for yourself! I work in a sales call center high-stress environment. We have purchased body back buddy for every team. 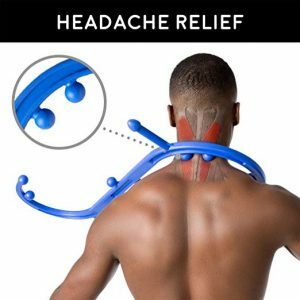 It is a piece of great massage equipment for working out the kinks in your neck, back, and shoulders. I enjoy it so much I bought one for my home for the rest of the family to use. Just a couple of minutes massage at a time is enough to give some relief and loosen up the tight muscles. This is highly recommended when you don’t have an on-call masseuse. This can be a good family gift for everyone this year for Christmas! 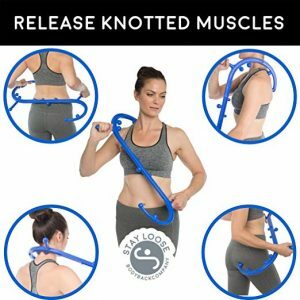 Everyone with frequent tension knots needs one! My dad had back and neck problem and tried everything on the market. I originally bought body back buddy for my dad and he was very happy with this deep tissue massager. After seeing how much he loved it I decided to purchase one for myself, and I’m happy too. Other massage devices similar to this was shaped appropriately but wasn’t strong enough to apply enough pressure. Didn’t think it would fit me because I’m a bigger guy, but now I can massage my shoulder, neck, and lower back by myself while I work on a laptop or watch TV. Body back body is an amazing tool that made my life a lot easier.